Black metal can be an enigmatic beast; from it's Norwegian origins to USBM to anywhere else in the world, it varies from band to band and continent to continent. 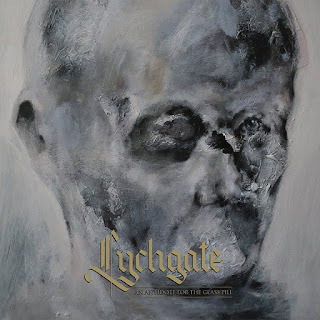 Enter the UK's Lychgate and their 2nd full length, An Antidote For The Glass Pill; a thoroughly horrifying album in the best way possible. Organs are a major piece to this quintet's sound and they at times can sound like a more mysterious Mr. Bungle. The overarching atmosphere is that of say playing some of the original Resident Evil games without a strategy guide; never knowing what lurks around the corner. Take for example the first track that showcases their style, 'Davamesque B2'; it swirls in and out of riffs and chords played through the organ as if it were a theme to a diabolical version of Clue. The feeling of impending doom is omnipresent and can be made real as the harsh vocals of Greg Chandler combines with the clean vocals and organ skills of Vortigern to scare the hell out of listeners. The more ominous and chilling sections feel like the bridge in an Opeth song and can inspire many of the same emotional reactions. Drum fills pepper 'Letter XIX' and add a solid groundwork for the rest of the band to work with. Who would have thought that a black metal song would be built off of organs and drums? More traditional black metal song structures exist on 'Deus te Videt' with the slow plod of guitars feeding into the chanted vocals and of course giving way to the aforementioned pipe organ. Traditional fans of black metal should flock to this album; why you may ask? Because it has all the hallmarks of being a black metal album musically and can be personified as a black metal Phantom of the Opera. This is by no means a traditional album, nor is it an easy listen; over time you pick up more and more pieces to this oh so intricate puzzle and it starts to take shape. Lychgate have promptly left you a piece of swirling evil that might make Portal or Mitochodrion blush (remember I said might). If you enjoy a bit of mystery and atmosphere to your metal listening look no further than An Antidote For The Glass Pill.